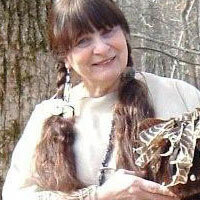 Dianne Moran is an award-winning storyteller who has worked with audiences as a folklorist/naturalist since 1992. She lives in the Missouri Ozarks where she owns Earth Ways Farm, an environmental camp. Her programs may include Mt. Dulcimer and relics, as well as her live animals which serve as metaphors for her stories. Dianne performs Chautauqua programs as a Civil War, and Lewis and Clark scholar throughout the Midwest. She has produced numerous CDs, tapes and videos of her living histories. Her programs receive funding from the Missouri Arts Council, Missouri Humanities Council, and received the Program Award for Artistic Excellence and Educational Effectiveness from Young Audiences of St. Louis. Dianne has performed for hundreds of school programs, workshops, and residencies, making her a curriculum regular for thousands of school children in Missouri and throughout the Midwest.